cosmix.org | Has Satch lost it? I first listened to Joe Satriani when I was in high-school, in 1995. At first I found his music pleasantly different from either the hair-metal 80s kitsch (even though some of his early stuff are clearly influenced by the æsthetics of the time) or, the fashionable genre of the time, grunge. Much of Satriani’s music can be characterised as a mixture of guitar virtuoso meets the blues meets the Mixolydian Mode. Some of his early stuff also include some elements of country, 80s music. He’s typically subtler and more structured than most other guitar virtuosos of his time (e.g. Steve Vai), his tracks often conveying a sense of dialogue between two guitars. Some people interpret Satch’s music as a never-ending solo; I tend to disagree: While the guitar undoubtedly has the central stage in his music, his phrasing, melody and structure hardly resembles what you’d define as the archetypal chorus-verse-solo structure of the Rock or Metal genres. Some of his tracks indicate very high levels of musicianship and convey strong emotions, characteristics that go way beyond your typical shredding passage. Still, over the years it has become clear to me that the Satriani ‘music well’ has long gone dry. That, despite his numerous releases Satch has not really outgrown the music of his first few albums. 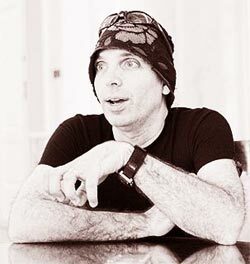 Ironically, he certainly seems to know it: Albums such as the synonymous 1995 ‘Joe Satriani’, the turn-of-the-century ‘Engines of Creation’ and the follow-up ‘Additional Creations’ indicate his immense desire to break-away from his now stereotyped music by ‘cutting all ties’ to the rock sound that largely defined him. Sadly, I’m afraid he hasn’t. Not in the sense that ‘Joe Satriani’ or ‘Engines’ were not different enough; they certainly were. They just weren’t that great. In 2006 Satriani released ‘Super Colossal’, his latest studio album and the first one after 2004’s ‘Is There Love in Space’. Both albums, as well as his previous ‘Strange Beautiful Music’ leave me cold. They are largely a rehash of older concepts, ad-hoc solos, the same structures, tonalities and sounds. Over and over again, but without those aspects that made ‘Surfing’ or ‘Flying’ exceptional in their time. They lack the soul, the sublime tracks (e.g. Crystal Planet’s ‘Ceremony’), the thought-out composition. They only offer a glimpse of the brilliance of his previous works. 1998 was the year of ‘Crystal Planet’ for me. And while that album was phenomenal in that it proved that there was more that Satch could do after his self-titled 1995 release, in a genre close to ‘Surfing with the Alien’, ‘Flying in a Blue Dream’, ‘The Extremist’, ‘Time Machine’ and ‘Dreaming #11’ without compromising on his musicianship or tone, I remember reading some reviews that labelled it as ‘yet another failed attempt by session virtuoso Joe Satriani to convince the world he’s a great musician’ or something to that end. At the time, I found the reviews outrageous, even blasphemous. As far as Crystal Planet goes, I probably still do; it was a great album if you like instrumental rock. Yet listening to his work ever since, I’d be much more cautious before dismissing a negative review as his releases in the past decade have not been worthy of his reputation as one of the great electric guitarists of the late 20th century, or his earlier work. Joe Satriani picture by Veeliam. Found on Flickr and licensed under CC. To the point: I think the post pretty much covers your criticism. I love Satch’s work and respect him as an artist, but I think his later work is mediocre by comparison and far from the revolutionary stuff (for its time) he released in his first decade as a solo artist. Is There Love in Space? is a great album. Super Collasal was a bit of a flop in my opinion, but there were a few good tracks on that album. How can you be a fan of Joe Satriani and not fall in love with Bamboo, Souls of Distortion, If I Could Fly, ad Is There Love in Space? They are all great songs and come off a great album. I’ll admit at first the tracks like Gnahhh and Lifestyle didn’t really appeal to, but as I started listening to the album a couple times through they started to grow on me. Joe is just playing on the guitar the music he hears in his head, and I think it’s great.